Teenage striker Kyle Patton on the attack for Whitley Bay against Seaham Red Star. An entertaining game that swung first one way then the other ended all square thanks to a stoppage time equaliser from Whitley Bay’s man of the match Tom Gilbey. A draw was a fair result with two evenly matched sides playing attractive attacking football in front of a crowd in excess of 300 on a mild January afternoon. For the first time this season Whitley fielded an unchanged starting 11 as manager Marc Nash kept faith in the side that crushed Chester-le-Street in midweek. The first chance of the game came in the seventh minute when Kyle Patton drove a shot into the side-netting after being played clear by Callum Anderson’s precision pass. Two minutes later, Gilbey crossed from the right and Thibault Charmey, stretching to reach the ball, scooped it over the bar from inside the six-yard box. Seaham’s first chance came when former Bay winger Robbie Bird brought a good low save from Tom Flynn. Two minutes later, Bird again raced in on goal only to be tripped by Ross Wilkinson as the two crossed paths. It was an undisputed penalty and Craig Lynch comfortably beat Flynn from the spot to put Seaham in front with 18 minutes played. Then it was Whitley’s turn to win a penalty when Callum Patton tumbled to the ground when challenged by Luke Proctor as he burst through on the right of the 18-yard box. Patton took the kick himself, sending keeper Shaun Newbrook the wrong way to level the score. Whitley continued to press forward and they were rewarded in the 33rd minute when Charmey won the ball 15 yards from goal, closed in and from a tight angle slotted the ball goalwards. Alex Kempster then got a vital touch, steering it through the legs of Newbrook and into the net to put Whitley ahead. Defences were on top for the remainder of the half and it was Whitley who held a 2-1 lead at the interval. That all changed within seconds of the restart when Lynch went down in the left corner of the Bay penalty area. Referee Rebecca Welch had no hesitation in awarding another penalty, deeming Wilkinson to have fouled the Seaham striker, who once again despatched the penalty with ease. With the scores level again it was anyone’s game, and Whitley went within a whisker of regaining the lead when Wilkinson’s low header from Tom Potter’s cross flashed inches wide of the back post. However, it was the visitors who went back in front on 62 minutes when defender Bradley Staunch was left unmarked at a right wing corner and headed firmly past Flynn from eight yards. Whitley battled back once again and when Callum Patton crossed into the box, Charmey poked the ball towards goal but without sufficient power and Newbrook made the save. Wilkinson then brought a fine save from the Seaham keeper, who pushed his powerfully struck shot over the bar. Kempster went close as the visitors came under sustained pressure, then with six minutes remaining Whitley had the ball in the Seaham net, substitute Liam Brooks knocking it home from close range. But the celebrations were cut short when the goal was ruled offside. It looked as if it was not going to be Whitley’s day, but then with the game entering stoppage time, Gilbey made a great run down the right and when the ball was played back into his path, he lashed a fierce drive past Newbrook to rescue a well deserved point. 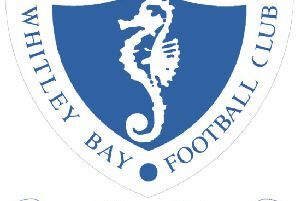 Whitley Bay: Flynn, Gilbey, McDonald, Anderson (Glen-Ravenhill 46), Wilkinson, Allen, Potter, C Patton, K Patton, Kempster, Charmey (Brooks 74). Subs not used: Munro, Haley, Keltie. On Saturday Whitley Bay travel north to take on local rivals Ashington at Woodhorn Lane, and then face a tough League Cup third round tie at holders Shildon on Wednesday evening.